Learn How To Drive FREE Targeted TrafficTo Your Website Or Blog. Can be implemented in less than 5 minutes (your actual time will vary depending on how much traffic you are trying to draw) for your new or existing hubs or lenses. This trick was discovered by accident. We created a lens for one Clickbank affiliate program and added tracking to the Clickbank URL. A few hours later when stats were checked, it was discovered that we had made 3 sales from the Squidoo lens that we had made. We were shocked! So we stopped everything and logged on to Squidoo to see what was happening. We looked at the lens stats and discovered that we had 198 visits to the lens in just a few hours. We had done just ONE thing differently when we created this lens. We tested this on Hubpages several weeks later and the same thing happened except this time we had 2 sales after a day. The Hub stats showed 131 visits referred by Hubpages and 148 by Google. That was just the beginning...now the sky is the limit as we make new HubPages and Squidoo Lenses daily to pull traffic to our opt-in and product pages in a ton of different niches! 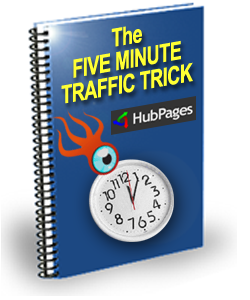 This report is about a simple trick that you can implement on your Squidoo Lenses and Hubpages that has the potential of generating lots of traffic to your lens in minutes.